The foundation representatives handed the donation to Phuket Governor Norrapat Plodthong in the morning when he welcomed Miss Grand Thailand 2018 contestants from 77 provinces across the country, who were scheduled to visit the homeless dogs at the shelter. The B560,600 was a part of B1.8 million in donations from several sectors. Mr Dalley also expressed his opinions about the stray dog shelter, mentioning that it is not a solution to end stray dogs suffering but is surely willing to support them to provide a better life for the dogs inside the dog pound. “We have donated B560,000 to have the whole quarantine area rebuilt and supply a new high-tech water filtration system,” he explained. “Soi Dog Foundation also provides all the medical treatments for the dogs, including vaccines and tick control. SDF vets attends the pound every week and seriously ill or injured dogs are taken to our hospital in Mai Khao. 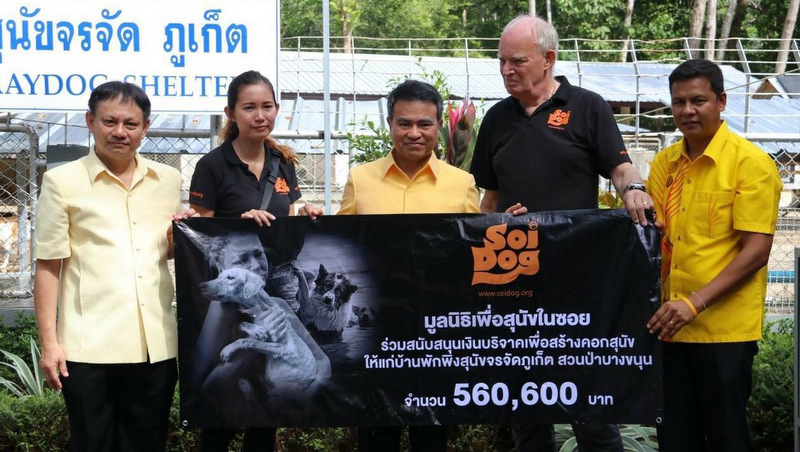 “Soi Dog Foundation, although not agreeing with the dog pound, are obviously concerned in helping to make conditions as good as possible for the dogs that are taken there. “We continue to advocate Capture, Neuter, Vaccinate, Release [CNVR] as the way to eliminate rabies and reduce the number of stray dogs,” Mr Dalley added. “This is also supported by The World Health Organisation, The Food and Agriculture Organisation of the United Nations and the Global Alliance for Rabies control. Removing vaccinated and sterilised dogs actually has a negative impact on both rabies elimination and population reduction,” he noted. In addition, he raised his concern about the tendency of increasing the number of stray dogs at the government shelter,” he explained. Apart from the concern on the raising number of stray dogs at the shelter, the founder of Soi Dog Foundation also mentioned that imported, unvaccinated puppies to Phuket is a cause of rabies issue while it also increases the number of strays on the island. “We would like to see the authorities stop the import of dozens of unvaccinated puppies from rabies endemic areas into the province for sale at markets and pet shops. The ones that are not sold are discarded. This would be far more effective in reducing the number of stray dogs in Phuket and keeping the rabies out,” Mr Dalley said.